The bird is huddled or crouching. Feathers are ruffled, especially the feathers on the back of the neck. The bird may look puffed up. The bird is reluctant to stand or move when you approach. The bird sits with his lower legs dropped to the ground, a posture called hock sitting. The bird separates itself from the rest of the flock. The bird eats or drinks less, or not at all. 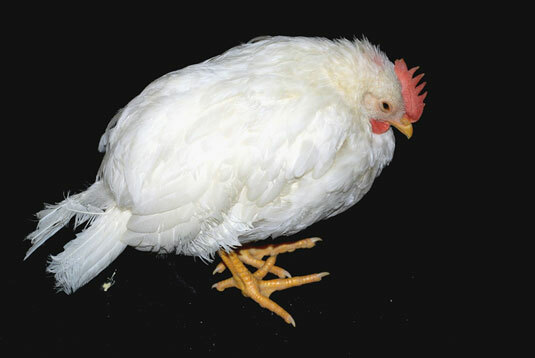 Seeing one or more of these signs of illness tells you that you have a sick chicken on your hands. Each of the signs can range from very mild to very severe. If you spot one or more of these signs, are you ready to get on the phone with your vet to ask for a diagnosis, or post a request for a treatment plan from your online flock-keeper friends? Not yet. These signs only tell you something is wrong, but they don’t tell you what. If you ask for advice at this point, you’re likely to receive more questions than answers. The next step is to do a more detailed investigation of the chicken and the rest of the flock in order to find the clues that may lead you to a diagnosis. Don’t give any drugs based only on the general signs of illness listed. These signs aren’t specific enough to give you a diagnosis and understand how to appropriately treat the flock. Collect more information and seek advice before you administer medication. In the best-case scenario, giving the wrong drug wastes money; at worst, the wrong drug can be harmful to your chickens or to people, if they eat eggs or meat from the treated birds.